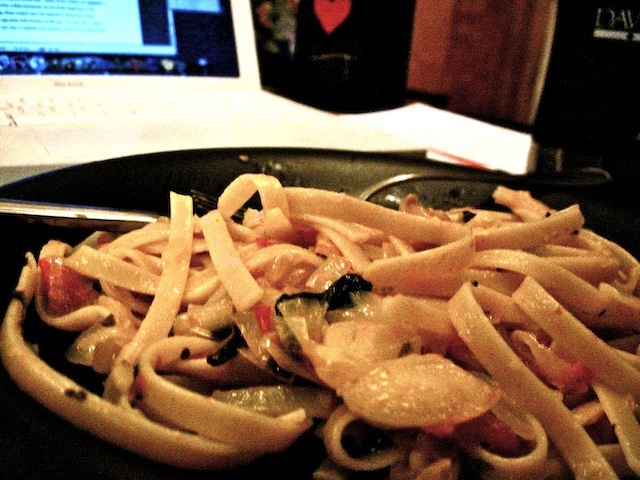 Something From Nothing: Pasta with Caramelized Onions and Tomatoes – Eat Me. Drink Me. I wish there was a tiny chorus of approving gourmands that lived over my left shoulder and gave me a round of applause and a miniature pat on the back from each of their sprinkle-sized hands every time I verged on the brink of culinary genius. Like when, after two months of mediocre results, I finally manage to make perfect foam with my espresso machine for four days in a row (right now! I’m drinking perfect foam! Isn’t it exciting?). Or when, on the spur of the moment, I add a layer of strawberry jam between two layers of ordinary yellow cake with vanilla frosting. Or when, coming home after a long day of work, I despondently shrug my shoulders at the mismatched food in my pantry, only to throw the mess together into something delicious half an hour later. But there are no invisible gourmands. It’s just me and my mouth and occasionally my roommates, who I make eat bites of my food as they walk past on their ways to something probably very interesting. Can I clap for myself? The result being that we scrounged up a salad with peppery greens, blue cheese, canned beets, almonds, and a dressing of oil, cherry flavored balsamic vinegar, lemon, Dijon mustard, and honey. We found a can of tuna and so made a tuna salad which we ate on the last slice of a dense, whole grain bread, split in two. We didn’t even eat my potatoes. The moral of that story is: there’s never really nothing, unless of course, there’s really nothing. I believe I’ve made this point before, but not everything one cooks will be a success. Not even everything will be good. I’ve made horrible mistakes. Ruining stir fry with too much ginger, underestimating the potency of fenugreek (never, ever underestimate the potency of fenugreek), attempting to make blue cheese and bruschetta work (it just sounds like it does). But for all of those failures, there will be amazing wins. And the wins are so much better because you figured them out yourself. It isn’t some recipe Martha Stewart’s food lackeys have tested hundreds of times to find just the right ratio of cumin to salt. It is one shot at something good, it’s Luke Skywalker blowing up the Death Star. So shoulder gourmands or no, I will continue to experiment, to resist having to walk in the cold to the grocery store, to finally use the jar of brined lemons, the fennel bulb, the semolina flour, and the tamarind paste. But maybe not together. This is one of those come-home-late-hungry-want-food-now dishes that I threw together a few nights ago. Super easy, super good. Melt butter in a saucepan and when melted, toss in yellow onion and brown sugar. Stir the onion slivers around until they’re past translucent and add garlic. In the meantime, put on a pot of water to boil and salt it if you’d like. After the water has boiled, add a handful of linguine and set the timer for ten minutes. After five minutes have passed on your timer, return to your onions: Add tomato, basil, and oregano and stir it around pleasantly. Season with salt and pepper. 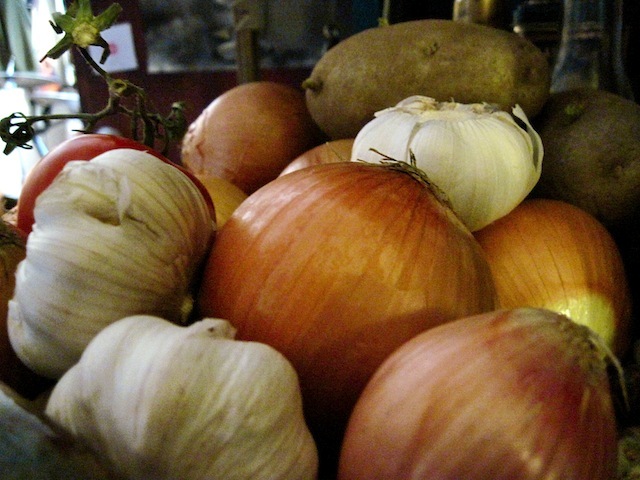 When your linguine is done cooking, drain it and rinse it with cold water, then add it to your onions and tomatoes. Toss everything thoroughly and maybe add a dash of olive oil to bring it all together.